Need a break from work and the kids? 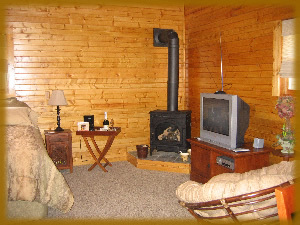 Sneak off and relax in our luxury cabin equipped with a king-size bed, 2-person whirlpool tub, fireplace, stereo, TV, DVD microwave sink and refrigerator. On-site couples massage by a licensed massage therapist, chocolate dessert and breakfast in bed also available. 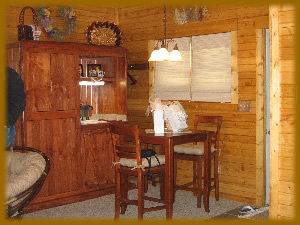 Queen-size beds with linens, stove, refrigerator, microwave, cookware, silverware, dishes, pull-out sofa, TV/VCR & DVD player. After an afternoon of sledding, skiing or ice-skating you can warm up beside the bonfire or in the 8-person hot tub - complimentary hot chocolate, included! Add to the memories and make cookies together in the comfort of the kitchenette. Remember to keep your EAGLE eyes open while traveling the countryside because Carroll County is known to attract wintering bald eagles! Whirl pool cottage equipped with bedroom, full bath & whirl pool tub, fireplace, wet bar, refrigerator, microwave, cafe table & sliding glass door to a deck, vaulted ceilings & knotty pine walls.